One of the best parts of spending your vacation in the convenience of a beach resort is that you don't even have to leave the premises to experience a complete and fulfilling getaway. From playing and lounging on the sand at the beach to exercising in the on-site workout facilities to renting bikes and enjoying swimming pools and more, vacation is just easier at a resort! Taking this convenience one step further, Litchfield Beach & Golf Resort also has on-site food and beverage options, including Starbucks, The Deck Tiki Bar, and our newly-renovated restaurant, Coastal Dish Lowcountry Dining. Coastal Dish can be found in the same place as our previous restaurant, Webster's, and has undergone construction and design updates, as well as a reboot of the dinner menu. With a focus on family-friendly atmosphere and Lowcountry cuisine, you'll find a wide variety of culinary options. Choose from appetizers like Coastal Nachos topped with BBQ chicken and the works, Pimento Cheese-Stuffed Jalopenos, and unique starters like Chicken Fried Bacon with Pepper Gravy or Hushpuppied Shrimp with Comeback Sauce. Entrees are impressive as well and feature a range of seafood options like Fried Flounder and Shrimp, Shrimp and Grits, Swordfish, and more. Food selections from the land include slow braised Lamb Ribs, Lowcountry BBQ, and Chicken Alfredo among other favorites. Choose accompanying sides that include macaroni and cheese, french fries, creamed spinach, lima beans, rive and gravy, cole slaw, and more! If you're looking for something lighter, Coastal Dish offers a variety of salad and sandwich options. From the Blackened Chicken Cobb to the Coastal Caesar, there's an option for all salad lovers. Likewise, diners will find a wide range of sandwiches, including our Lowcountry Crab Cake Sandwich, Coastal Burger, Pulled Pork Sandwich, Shrimp Po' Boy, and much more! If you're looking to grab something quick and return to your condo, be sure to browse our delicious pizza menu, where you can order a customized pie made with our delicious house-made red sauce. 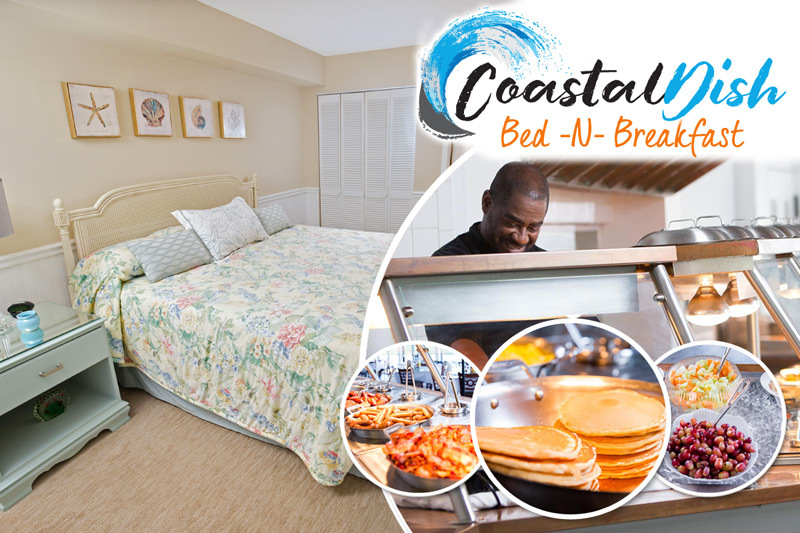 In addition to our new, exciting dinner menu, Coastal Dish will continue to serve breakfast daily, with a full buffet spread, including morning meal favorites like omelets, grits, eggs, bacon, sausage, oatmeal, fresh fruit, pastries, juice, and coffee. Breakfast hours are from 6 a.m. to 10:30 a.m. Monday-Saturday, and from 6 a.m. to 11 a.m. on Sundays, so stop by for a quick fill-up before heading for an amazing Pawleys Island beach day! Stay tuned for future updates on special menu offerings and holiday events. Remember to experience the deliciousness of Lowcountry cuisine at Coastal Dish during your next vacation experience at Litchfield Beach & Golf Resort in Pawleys Island, South Carolina.